The moment someone calls an emergency locksmith, they’re usually desperate. They need to get into their home or car, and get in quickly. It may be the middle of the night or on a weekend, and they may be frightened about not having a good place to sleep or not being able to go home. Reputable emergency locksmiths will do great work no matter what time they’re called. They take the “emergency” part of emergency services seriously, and strive to help customers in a bad situation. However, there are a few companies that take advantage of the good work these companies do. They use others’ positive reputation to scam people out of their hard earned money. Here’s how you can spot and avoid scammers, and find a reputable locksmith. Watch out for any locksmith company that doesn’t give their business name over the phone. This is something many scam artists do to protect themselves. If the locksmith doesn’t state their legal business name over the phone when he answers, ask him to state it before you begin your conversation. If they won’t, you should find another locksmith. You should also make sure that the company you talk to isn’t trying to use the name of a reputable company. Many scam artists copy the names of well-reviewed locksmith services, making just enough of change that they’re technically not using the same name. You definitely don’t want to work with any of these companies. Most scam companies operate by doing the work a customer hires for them, then charging a ridiculous price once the work has been completed. People who are taken advantage of by these scammers may be out hundreds upon hundreds of dollars. Emergency rates can be costly, but they’re still reasonable. Legitimate locksmiths don’t charge a fortune for a single job. You can avoid those things by being careful on the phone. After you call a company, the first thing you should do is ask for an estimate. If they hesitate to give you an estimate, that’s a bad sign. They should be able to give you an estimate almost instantly. If they won’t, that’s a sign that they may try to charge you an exorbitant price. Ask if the locksmith’s estimate includes additional charges for things like the service call, the emergency hours, or their mileage. Some scam artists will try to trick people by quoting them a reasonable price, then hitting them with additional fees once the work has been done. Tell them you want the estimate to include all costs. You should also tell them that you’ll want a written copy of the estimate after they arrive. This will make it nearly impossible for them to try to scam you out of your money. If they try to make excuses about providing you with a written estimate, then they’re not the company you want to work with. When the locksmith does arrive, pay attention to their vehicle. Most legitimate locksmiths will arrive in a car clearly marked with the name of their business. Some legitimate locksmiths use their personal car when they are on-call, but this is still a sign you should approach the situation with extra caution. 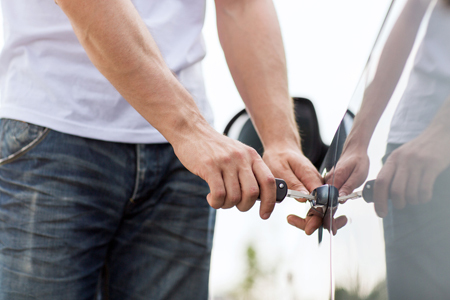 Once the locksmith exits the car, ask for your written estimate right away. Don’t allow them to begin the work until you have it in hand. As the locksmith works, you should pay close attention to how they handle the problem. If they want to drill or get rid of your lock entirely, that’s a bad sign. A real locksmith should know how to get through your door without damaging the lock. In most cases, a lock will only need to be removed if it’s defective in some way. Now that you know how to spot and avoid bad locksmiths, you should also know how to find good ones. It’s a good idea to research locksmiths before you need them. Store the number in your phone, and you’ll have someone to call if you do wind up locked out in the middle of the night. The most important thing you can do is find referrals. Talk to the people you know and find out what kind of emergency locksmith services they’ve used. Make a note of any company they say positive things about. If someone says negative things about a company, be sure that you don’t call them in the future. You should also check local review sites. Many of these sites will expose scammers. When reading reviews, make sure the reviews apply to the emergency services and not standard locksmith work. Make a list of the best companies you’ve seen, and spend some time researching them all. Take a look at a locksmith’s website. Do they have a lot of experience? Are the prices they quote reasonable and fair? If so, they’re a locksmith you may want to call in the future. Keep their number on hand so that you can call when you need them. While most emergency locksmiths are excellent workers who are dedicated to their job, there are a few scam artists out there who prey on innocent customers in a bad situation. Make sure you avoid these people and instead work with a locksmith with a great reputation.